Finances are boring - but making charts and graphs is fun! It is even more fun if you can see your earnings over time to see how much money you save each years, or as a monthly average. If you have kids, it would be a fun craft project to create a poster-board chart so your kids can track their own finances on a smaller scale. When it comes to kids, this is the only situation where the Comic Sans font is admissable. Usability tests say Kids are more attracted to Comic Sans than Times New Roman or even Verdana. Start by writing down the date in the first column. You can track every month, week, or at random times, it doesn't matter too much. If your kids have an allowance, update their charts when you give them their allowance or each time they get money from gifts or chores. Adult finances are more complicated! Microsoft Excel is my spreadsheet designer of choice, particularly the newer version with better default color options. Digital is the way to go if you are dealing with lots of numbers since you can use functions like sum() and vlookup() to do the math for you. Plus, if you show it to your financial advisor, he will be impressed! The best thing about the following chart is that it's a great way to track your credit spending and keep a rein on your accounts. You'll easily see all of your accounts at once. ﻿﻿﻿ ﻿ Adult finances deal with a lot more variables. But you can still track your spending using a chart like this fictional example. This is pretty much what I do, but with a few more accounts. Keep in mind that this doesn't track cash at all - it assumes that any cash I deal with is withdrawn from one of my credit union (or bank) accounts, so if I get any cash under the table, like a Christmas gift, then it doesn't factor into my calculations. The object here is to sum up all of your "cash" on hand - that is, what you have in the bank. I have a sum() column to show the total checking + money market + savings. But I need to keep track of what I have spent on my credit cards as well to really know how much I actually have. So the next few columns show the balances. If I make a new row right after I paid off my card then it would show $0.00 balance. I added the due dates for my credit cards here so I have an extra reminder of when I'll need to pay the bill. The last column totals up the Total Cash - Total Charges to tell me how much I have. Again, these number are completely fictional. 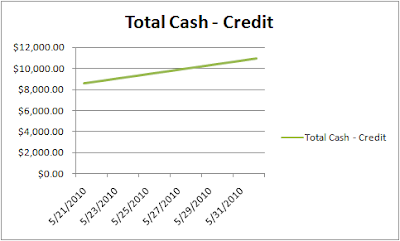 Last but not least, I can highlight the Date and Total Cash - Credit columns and make an instant graph of how my money has changed over time. If you keep track of this, it will be easier to know if you need to curb your spending - ideally you want the line to be going up like this one. If your graph is really exciting, you could print it out, frame it and hang it on the wall in your home office.